Do you know the biggest risk factor for a sprained ankle? Well, it’s a previous ankle sprain! And there are other factors that may be putting you at risk so read on to learn how to treat a sprained ankle the right way – so you’ll heal up for good. Thankfully, I’ve never sprained an ankle. However, I remember a few guys back in the day who suffered from recurring ankle sprains and they were typically basketball, soccer, or volleyball players, including my good friend Damian. Damian was one of if not the best basketball player in my high school and he’s now a personal trainer running a successful and innovative fitness studio called Xelf in my old hometown of Hamilton, Ontario. And he had some of the stiffest ankles I’ve ever seen – there wasn’t an ankle range of motion where he wasn’t limited. Stiff ankles led to many limitations for Damian including all sorts of compensations for most movements including running, squatting, playing sports – you name it – when the ankles are stiff, everything that involves moving your lower body must compensate for them. This is what happens when a joint has suffered repeated trauma without effective rehabilitation strategies – it stiffens right up whether it’s due to scar tissue, bony adaptations or neuromuscular guarding – if you’re not taking the correct actions, your body will do anything to try to prevent further injury by making the joint rigid. So that’s what we’re covering in this article – exactly how to treat a sprained ankle to restore full function so you’re not limited to doing the things you love. Before we get into how to treat a sprained ankle, we’ve got to determine some factors about your injury, including the type of sprain that has occurred. There are several different types of ankle sprains. Which one you have depends on the nature and location of your injury. By far the most common type of ankle sprain is an inversion sprain. This occurs when the foot rolls too far inwardly, causing an injury to the lateral side of the ankle. About 85% of ankle sprains are inversion sprains . Eversion sprains, on the other hand, happen when the foot rolls too far outwardly – causing an injury to the medial side of the ankle. This type of sprain is less common than inversion sprains. A high ankle sprain is an even less common ankle injury, but they do occur. This type of sprain involves ligaments higher up the ankle that connect the tibia and fibula bones of your lower leg. To determine if this injury is at play, there’s a pretty simple test, the external rotation test . To start, sit on a chair and cross one foot over so the shin is resting on the thigh. Grab your lower leg, right above the ankle, and hold it steady. With your other hand, grab your heel while supporting your foot with your hand and externally rotate your foot (so the toes point down). If you feel pain above the ankle when you do this test, it’s a pretty strong sign that you’re dealing with a high ankle sprain. But because inversion ankle sprains are the most common, we’re going to focus on them in this article. You might have heard it called “twisting” your ankle or “rolling” your ankle, or some other name, but all of these terms describe the unpleasant and unfortunate movements that can result in a sprained ankle. Ankle sprains typically happen when your movement shifts quickly while your foot is planted on the ground. If the ankle rolls outwardly while your foot rotates inwardly, as is most often the case, you have an inversion sprain on your hands. As you can see, ankle sprains might happen if while running or playing sports you misplant your foot, catch the lateral edge of your foot when stopping or changing direction or land off-balance after a jump . However, it can also easily happen just by misstepping while traversing an uneven surface, like maybe a rocky beach or a bumpy field. Ankle Sprain or Something Worse? When it comes to ankle injuries, it is important that you rule out a more serious injury, like a fracture, before you start to rehab. Failing to do so can lead to an injury that won’t heal properly or an increased chance of reinjury in the future. The Ottawa Ankle Rules are a simple set of guidelines that can help rule out an ankle fracture immediately after the injury occurred . Feel for pain and tenderness along your tibia and fibula. Do so by gently pressing along both the medial and lateral sides of your leg, starting just above the ankle bone and continuing toward your knee for about 6 centimeters. Check for pain and tenderness at the 5th metatarsal and the navicular bone. Do this by gently pressing at the base of your 5th metatarsal (which runs down the length of your midfoot to connect the bones of your ankle to your pinky toe) and your navicular bone (which you can feel for on the medial side of your foot – just below and slightly in front of your ankle). See if you can take 4 steps while bearing some weight on the injured ankle. If any of these checks causes you pain, you should probably go see a doctor for imaging that will rule out a fracture. But, if you are able to bear weight and performed the tests pain-free, it is unlikely that your ankle is anything more than sprained, and an x-ray is probably an unnecessary expense. Not all ankle sprains are created equally, and just as the intensity of the injury can vary, so will recovery time and rehab needs. Generally, ankle sprains are divided into 3 categories, based on severity. In Grade 1 injuries, the tissue is overstretched, but only minorly and on a microscopic level. You might see a bit of tenderness and swelling, but it’s slight and you can still get around fairly easily . In Grade 2 sprains, the tissue has been overstretched on a larger, macroscopic scale. If you have this type of sprain you’ll definitely be more hindered in terms of your functioning, and the swelling and pain will be moderate, but not severe. You’ll likely feel slightly unstable and your range of motion will be reduced. In Grade 3 sprains, a ligament has been torn completely. If this is the case, you’ll experience a good deal of swelling and pain. You will feel very unstable on your ankle and be extremely limited in what you can do. You’ll need to seek professional help if you suspect a Grade 3 injury. The big problem with an ankle sprain is it makes you more susceptible to future sprains, which is why you must rehab COMPLETELY. It’s important to be patient when learning how to treat a sprained ankle*, because jumping too far ahead will only slow you down in the long run. That means going through the 4 phases to rehab I’ll describe below, without cutting corners or forcing yourself along. Phase 1 will take place in the period immediately following your ankle injury. During this period, you want to rely on the old classic standby of RICE – Rest, Ice, Compression, and Elevation – as your guideline. Only use ice and/or compression for a max of 10 to 15 minutes at a time, and allow yourself to get plenty of rest. Avoid painkillers, which won’t do much to help heal you, and instead opt for natural anti-inflammatories. Omega-3’s, a turmeric supplement like PuraThrive, or collagen-packed bone broths are all awesome ways to decrease the inflammation of your injury. If you’ve got a Grade 1 sprain, Phase 1 should take place in the first 3 days following the injury. If you’re dealing with a Grade 2 sprain, you’ll likely need to drag this phase out a few days longer, perhaps even for the first week after your sprain occurs. During Phase 2, you should be able to cut back on the rest a bit, but you should still be taking it easy on your ankle. Avoid explosive movements like sprinting and jumping as well as aggressive stretching. You’ll also want to stay away from any movements that rotate the knee or ankle – like changing directions when running, or any activity that might lead to similarly unpredictable movements. If you aggravate the area, return to that ice application. But otherwise, you’ll want to instead incorporate gentle heat. Heat will promote blood flow to the injured area, which helps deliver nutrients and encourage healing. At this point, it’s time to start incorporating some exercises back in. Try some open chain movement in all ranges of motion – as long as there is no (or very minimal) pain. Be sure that all ranges of motion at the ankle are getting some work – including plantarflexion (pointing the toes down), dorsiflexion (lifting the toes up), and both inversion and eversion of the foot. Be especially careful with inversion movements, as an extreme movement of this type likely led to your injury. However, it’s good to incorporate movements in this range of motion as early as possible to stimulate proper ligament healing. Just pay attention and back off if you notice any pain! One good example is to practice balancing on one leg – just be sure to be next to a wall or chair or something else that you can grab easily and quickly if you lose balance! For Grade 1 injuries, Phase 2 will probably last for days 3 to 7 after your injury. If you have a Grade 2 sprain, plan on Phase 2 lasting anywhere from day 7 to day 21. To start, build slowly with each different activity type and go from there. For example, to start reincorporating jumping movements back into your routine, start with simple, gentle hops in place. Over time, progress to forward and backward jumps. Only progress to side to side jumps after you’ve worked your way up and are pain-free. For running, start first with some light jogging. Next, incorporate some sprints to prepare your ankle for those fast movements. As a final step, practice changing direction mid-run. Start SLOWLY at first and make sure you can maintain control! To get back in your strength training routine, start with squats first. After a while, progress to forward and backward lunges. As a final step, build to lateral, or side-to-side lunges. If you’ve got a Grade 1 injury, Phase 3 could start anywhere from day 7 to day 28 after your injury, depending on the severity of your sprain and on how Phases 1 and 2 have gone. For Grade 2 sprains, you won’t want to dive into Phase 3 until AT LEAST day 21 post-sprain. Remember, patience is key when it comes to ankle sprain rehab – jump the gun and you could only be setting yourself up for reinjury. You’ve got to allow those tissues to heal so that they can rebuild proper strength. Here are a few more techniques that will be helpful to incorporate in as you work to rehab your sprained ankle. This is a great exercise for strengthening the ankle in a wide range of movement while also improving hip mobility. Move deliberately to focus on building up that ankle range of CONTROL – not just the range of motion. This drill will help you strengthen your single leg balance. You’ll definitely feel this one in the gluteus medius, but it is helpful for strengthening that balance along the entire kinetic chain – including at the ankle and foot. 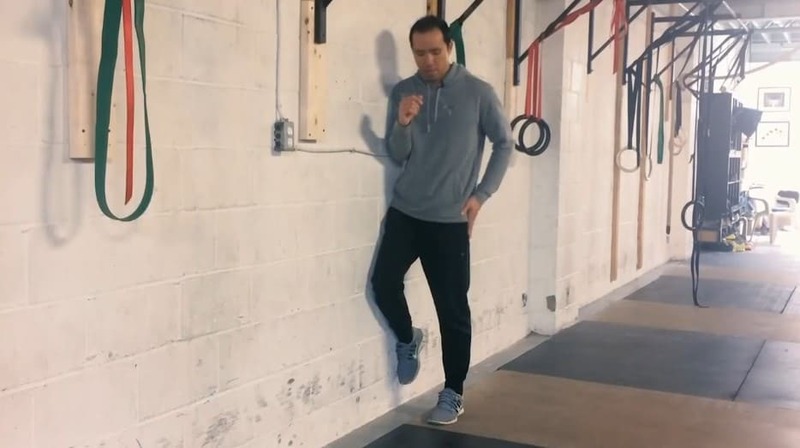 This move is excellent for strengthening, mobilizing and just generally training the ankle dorsiflexors, while also working the hip flexors and prepping you for achieving a deeper squat. Start to incorporate these exercises and more and more activity as your ankle starts to heal. Remember to take it slow and to back off if your injury becomes reaggravated. By working to rebuild strength and mobility in the ankle, and all along the kinetic chain, you’ll help your body heal effectively and reduce your chance of a reinjury.